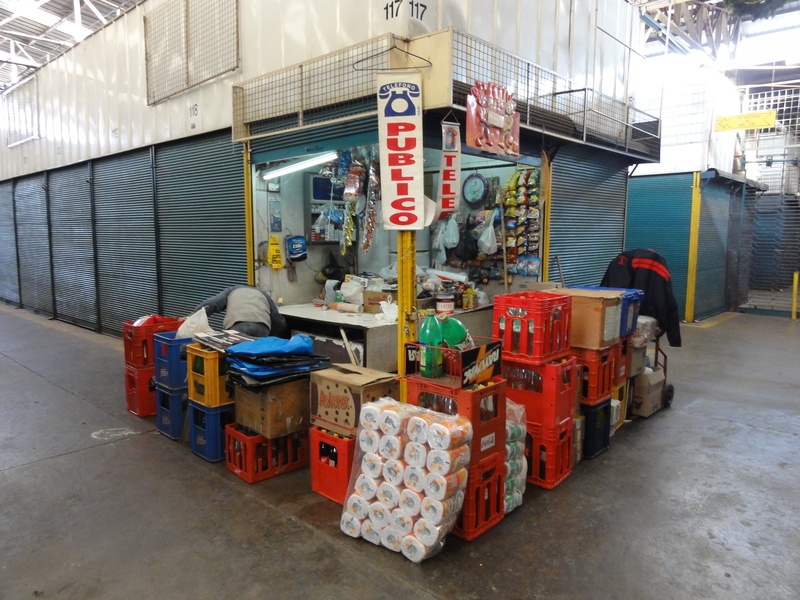 Building on my previous post and given that my research’s intent was to observe and document public market and street vending typologies in Latin America, what follows is a generalized and brief summary of what I have identified as Santiago, Chile’s four primary kinds of vendors. Of course, the lines between these is at times blurred, yet, at other times, there is a clear distinction between each and this often characterized the relationship I observed between these different entities. These are legal venues where, in addition to the average local, feriantes or coleros may buy their goods for resale. Vendors here have city issued permits and may have connections with national and international wholesale vendors. 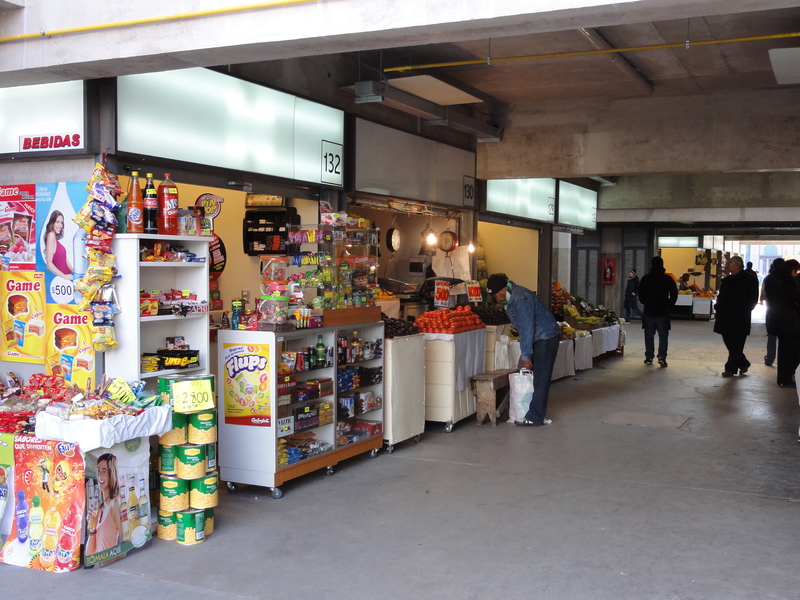 An example of this is the recently opened Mercado Tirso de Molina, which houses 100 plus vendors on its two floors. Here, what may be taking place may be illegal just as easily as it may be legal. Within the persas walls are permitted vendors who may sell anything from used books and magazines to bundles of imported Chinese goods. Just as easily and with a quick turn of the body, one could find piles of stolen goods within those same walls. (I was told to visit the enormous Persa Bio Bio were I ever to have anything stolen during my stay in Santiago and were interested in buying it back.) Typically, these persas would be retrofitted warehouses or held within corner shopping malls. The Persa Bio Bio covered approximately four blocks along a former lumber and train yard and took a whole day of wandering to cover. 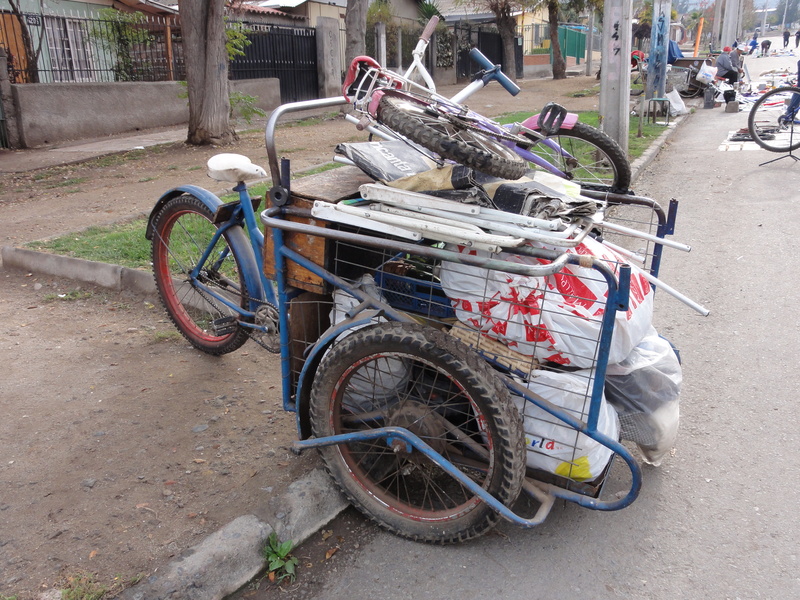 Along the persa itself and within and along the narrow streets that run through it were several vendors or coleros whose wares were placed on thin sheets, ready to be lifted and taken away at the sight of a carabinero or police officer. However, the weak carabinero to colero ratio seemed to pose little to no threat to the coleros. Permitted feriantes or street market vendors, likely having bought their goods from mercados early in the day or week, sell their goods in these ferias, two or three of which are located within Santiago’s many comunas. Ferias libres are open only one or two days a week, given their ephemeral nature as quickly assembled stands along temporarily closed streets. 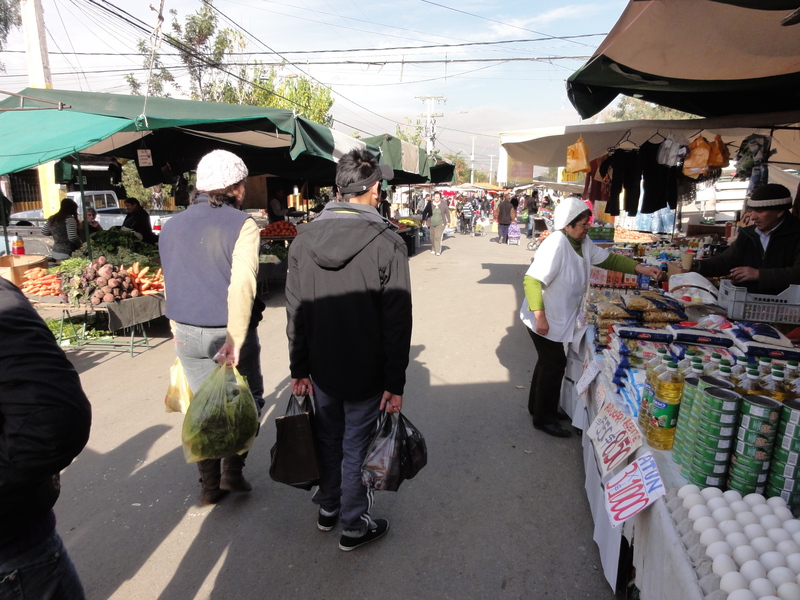 Others are open more often and are recognized as ferias modelos given their more stable state under permanent canopies and open-air structures in addition to differing administrative and bureaucratic approaches. As mentioned in a previous post, at these ferias, such as in the Feria Huechuraba, coleros were just as visible and equal in numbers as they might be around persas. These illegal or non-permitted vendors are typically found adjacent to ferias and persas, as well as along busy avenues and paseos or esplanades. Often times, they display their wares on thin 4 x 6 foot sheets with strings tied at each corner. The attached strings make it easy for coleros to yank at them and quickly walk away with their goods and away from threatening carabineros who may cite them. Amongst coleros, these simple sheets are respected as the boundaries that separate them should they find themselves side by side, which they often do. Additionally, voids between them mean something and are just as respected. At times, coleros simply carry their goods around, intricately attaching them to their clothing and hanging them from their arms. Other times, the coleros lay out modular tables that could easily be dismantled. 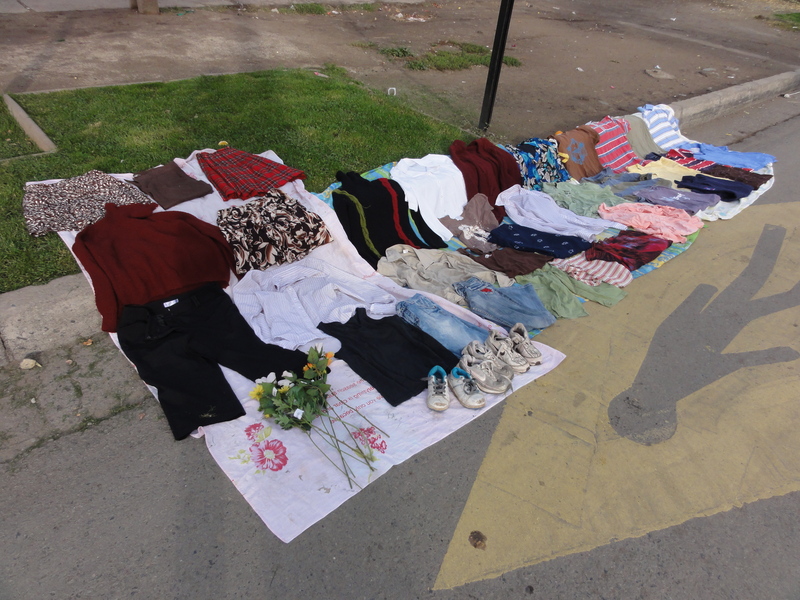 While most vendors appeared to have a routine location and schedule, others seem to descend upon a place in a kind of flash mob manner, quickly dropping their goods onto the floor and just as quickly disappearing after attracting enough customers with price hollering to satisfy their needs. This summary is brief, but tries to illustrate how the dynamic between vendors works and how access to changing and influencing space by these different parties varies. Everyone is attempting to maximize the use of their “box” – be it with the consent of others or not. ← Incremental housing or Sites&Services Reloaded?